Geneva – IOM, the UN Migration Agency, reports that 73,696 migrants and refugees entered Europe by sea in 2018 through 9 September, with 32,022 to Spain, the leading destination this year. This compares with 128,993 arrivals across the region through the same period last year, and 298,663 through a similar point (13 September) in 2016. Spain, with over 43 per cent of all irregular arrivals on the Mediterranean through this year, has outpaced Greece and Italy throughout the summer. Italy’s arrivals to date – 20,319 – are the lowest recorded by IOM since 2014, lower in fact, than arrivals recorded by Italian authorities during many individual months over the past five years. The same can be said for Greece, whose totals for irregular migrant arrivals through the first week of September this year (20,430) recently surpassed arrivals to Italy. It is the first time that has happened since the early spring of 2016. IOM Italy’s Flavio Di Giacomo reported late Monday that some media outlets have learned of a shipwreck off Libya with at least 100 migrants believed to have drowned. Details were few after initial reports, with some dispatches—thus far unconfirmed—suggesting as many as 115 people may be missing at sea with another 15 bodies recovered, including those of Libyan nationals who may have been among the smugglers, not passengers. These reports indicate as well that survivors had been returned to Libya. IOM Libya’s Maya Abu Ata, later Monday, offered these details: a single drowning incident occurred on Saturday (1September) after which a Libyan Coast Guard unit returned a boat to Libya and transferred all migrants on board to a detention center. This operation references two rubber boats intercepted with a total of 278 people on board. Among the survivors were 48 women and 48 children. Authorities report the remains of two people were retrieved and that, additionally, around 25 migrants are missing, according to what survivors told the Libyan Coast Guard. So far this year, around 13,000 migrants have been returned to Libyan shores after being rescued or intercepted at sea. IOM Libya also reported it has resumed Voluntary Humanitarian Return flights out of Tripoli after a ceasefire was declared there. IOM Spain’s Ana Dodevska reported Monday that 32,022 irregular migrants have arrived by sea this year via the Western Mediterranean, of those nearly 9,100 arriving in the 40 days since the start of August, a rate of 227 per day. For the first nine days of September, irregular migration arrivals on the Western Mediterranean route were running at a rate of nearly 300 per day (see chart below). Dodevska also shared recent data on the nationalities of those arriving this year by sea. Nearly 60 per cent she reported are from Sub Saharan Africa, including large contingents from Mali, Guinea Conakry, Côte d’Ivoire and The Gambia. About a third of all sea arrivals – have been classified as ‘Sub Saharan African’ because definitive proof of citizenship had not been obtained. Of those who can be classified by nationality, the largest group of Sub Saharan Africans appear to have arrived from Guinea Conakry, followed by Mali, The Gambia and Côte d’Ivoire. Another large contingent is arriving from Morocco. Dodevska explained that arriving migrants in Spain first are attended to by Red Cross staff (who offer first aid assistance, blankets and dry clothes). Afterwards, the Spanish Ministry of Interior takes over for an identification process (photos, fingerprints are taken of everyone) which she said can take up to 72 hours, although often is completed much sooner. Dodevska explained those arriving by land route to Ceuta and Melilla are transferred to the Centres for Temporary Stay of Immigrants (CETI) and placed in the autonomous cities of Ceuta and Melilla. These two centres are also under the competence of the Spanish Ministry of Labour, Migration and Social Security. On Monday, IOM Athens’ Christine Nikolaidou reported that over five days (04-09 September) Hellenic Coast Guard units (HCG) managed at least five incidents requiring search and rescue operations off the islands of Lesvos, Kos and Symi. The HCG rescued a total of 113 migrants and transferred them to those islands. Additional arrivals of 753 migrants during those days to Samos and Kos – as well as to Lesvos, Chios and Rhodes – bring to 20,430 the total number of irregular arrivals to Greece by sea in 2018. 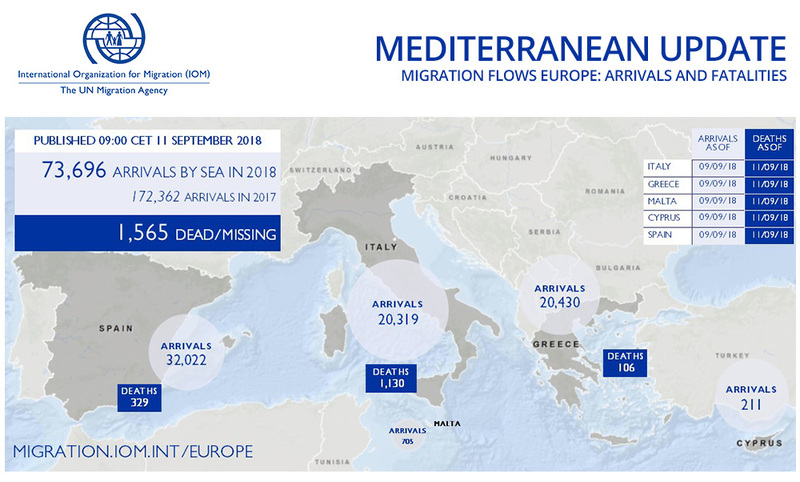 In addition, some 11,050 land arrivals have been recorded on the Eastern Mediterranean through the end of July, and an unknown number since 1 August. Greek arrivals through the first nine days of September – some 1,505 men, women and children – are already past the half-way point for each of the previous months of March through August, and more than each of all the arrivals for the full months of January and February. This may be an indicator of a shift of some migration routes away from Libya towards Italy with more irregular migrants seeking passage through Turkey and other states in the region (see charts below).